/ So Did I screw up and get the wrong machine? So Did I screw up and get the wrong machine? RE: So Did I screw up and get the wrong machine? Hopefully, you got a fully data-capable machine. (06-07-2017, 01:55 PM)Crimson Nape Wrote: The newer AS 10's aren't being shipped with a SD card installed. Any SD card 2gb or larger is all that is needed. You'll be hard pressed to find one as small as 2Gb now anyway. A lot of us use the Toshiba WiFi card so we don't have to keep transporting it to and from the computer. For me, I'm just plain lazy. Autoset, Autoset For Her, or Elite = Good! I'll send you a PM with a place to look for some nice refurbs that are reasonably priced. 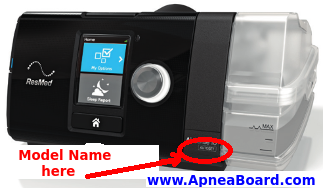 I am using the Dreamstation Auto CPAP now. Can I check if need to copy the "P-Series" folder to this wifi card to replace it? Getting tired of unplugging the SD card to my mac and then plugging it back again to the CPAP. You have me confused. You were talking about a Resmed and now your are talking about a Philips-Respironics. I am ignorant as to the the file structure of a P-R machine. With that said; If you wish to maintain previous data from another card then yes, copy the complete contents from the old card to the newer WiFi card. I am guessing that you have been downloading the SD data to a directory on the PC for archival. If so, there really isn't a reason to copy archived data back to the WiFi card. If you need to present the data to a doctor, use a regular SD card and copy the data from your PC to it prior to the doctor's visit. Don't use a WiFi card to transport data the doctor's office. Think you are mistaken, I didn't say I have a Resmed before. Nonetheless thanks for the advice. Sorry, st8800. I seem to be unable to associate a user's name with a post today. I was reading jasonarmstrong's post and thinking you. I'll blame it on a bad pot of coffee. . . Just ignore me. No worries... we all have our off days.